It’s tax season and if it’s not bad enough that we have to pay our taxes there are lowlifes out these trying to steal what we have left. I received an email today supposedly from Federal Tax Payment System thanking me for using the online payment service and giving me a confirmation number. 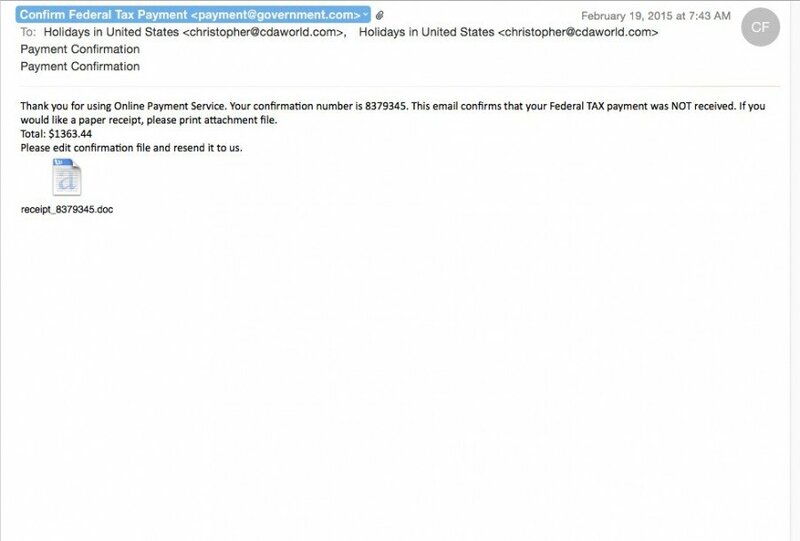 The email states ‘This email confirms that your federal tax payment was not received’ and has a word document attached. However, if you try to open this document you’ll see that it has macros built into it. I don’t know what the macros do and I’m not going to find out. But if you receive an email similar to this please do not open the attachment just delete it. As I always recommend do not open any attachments in email from a source that you have not verified as sending you that email. Here is what my email looked like.